Notes: Cover shows John Churchill, 1st Duke of Marlborough accepting Marshall Tallard's surrender at the Battle of Blenheim - very rare postmark on this cover. Immaculate condition. The above Royal Mail British Army stamps were issued on 06 July 1983 by Royal Mail and feature the following stamp designs: 16p Royal Scots; 20 1/2p Royal Welch Fusiliers; 26p Royal Green Jackets; 28p Irish Guards; 31p Parachute Regiment. 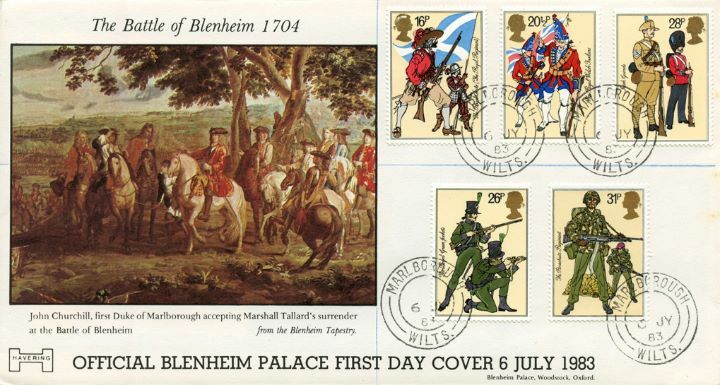 The Battle of Blenheim first day cover with the Marlborough CDS Postmark postmark has been produced by Havering and features these stamps which can make a very collectible and lovely gift.